HISTORY OF THE HUMAN SCIENCES aims to expand our understanding of the human world through a broad interdisciplinary approach. The journal publishes articles from a wide range of fields – including sociology, psychology, psychiatry, anthropology, political science, philosophy, literary theory and criticism, critical theory, art history, linguistics, and the law – that engage with the histories of these disciplines and the interactions between them. The journal is especially concerned with research that reflexively examines its own historical origins and interdisciplinary influences in an effort to review current practice and to develop new research directions. James Good, the editor of History of the Human Sciences for 15 years, will be stepping down at the end of 2014. The incoming editors are: Dr Felicity Callard (Durham University) [Editor-in-Chief], Dr Rhodri Hayward (Queen Mary University of London), Dr Angus Nicholls (Queen Mary University of London). They have assumed responsibility for new submissions since 1 July 2014. Dr Chris Millard (Queen Mary University of London) takes over as the new Book Reviews Editor. The journal also welcomes the following new members to the Advisory Editorial Board: Dr Sabine Arnaud, Prof Cornelius Borck, Prof Jamie Cohen-Cole, Prof Stefanos Geroulanos, Prof Sarah Igo, Prof Junko Kitanaka, Prof Rebecca Lemov, Prof Michael Pettit, Dr Chris Renwick, Dr Sadiah Qureshi, Prof Barbara Herrnstein Smith, Prof Marianne Sommer, Prof John Tresch, and Dr Neil Vickers. Each editor is based in a different discipline – geography, history, and literary studies / critical theory – and all have strong cross-disciplinary interests. They look forward to continuing the journal’s rigorous interdisciplinary investigation of the human condition. 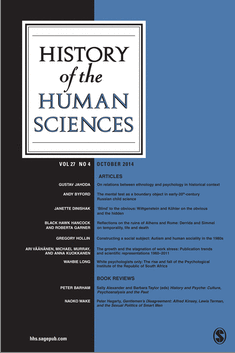 More information is available at the journal’s website (http://hhs.sagepub.com).